Beautiful home sits on high homesite in sought after Falcon Lakes. 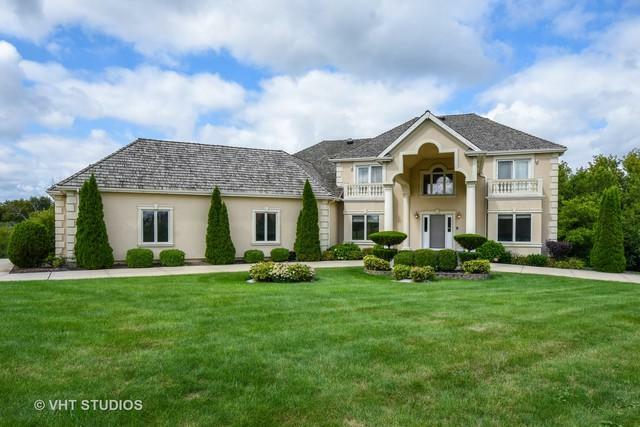 This large home welcomes starting in the two-story foyer with marble floor & grand chandelier. Formal living room and dining room are showcases for holidays & flow into other first floor spaces. The sunken two-story family room commands attention with a floor to ceiling fireplace, hardwood floors and outdoor views. An expansive kitchen is the heart of the home with granite counters, center island, breakfast bar, eating area, stainless steel appliances & large deck nearby. An adjacent second kitchen makes preparing for a crowd easy. The beautiful master bedroom suite includes a private luxury bath with jetted tub, separate shower, dual sinks & large walk-in closet. Other bedrooms are spacious with private or adjoining baths. Gorgeous finished walkout lower level has bar area, media room, game room, exercise room (could be a 5th bedroom) full bath & more. Elegant finishes and inclusions throughout!